The premise for The East is promising, albeit simply a more socially aware variation of the much better German film, The Edukators. The most frustrating aspect of the film is not the wasted concept, however, but the self important way with which the material is approached. The left-wing agenda is not even as strong as the filmmaker’s arrogant airs of self importance in filmmaking. Even with a strong visual style, director Zal Batmanglij doesn’t have enough narrative convictions to tell a convincing story, a flaw which I would attribute to the fact that he continuously allows his star to co-write screenplays with him. When attending a screening of The Sound of My Voice, Batmanglij’s debut feature which was also co-written by lead actress Brit Marling, I witnessed an interview with the director and his co-writer. It was clear by the manner in which he deferred everything to Marling who has control in the filmmaking process. I don’t know what Batmanglij’s relationship is with the actress, but Marling appears to have far too much influence at the detriment to each project, all the while Batmanglij seems content to follow along like a lost puppy. This is as much of a problem as the narrative’s detours into unnecessary romantic relationships between the terrorists. The minute-long scene where we watch Marling do nothing but cry on a bridge with some of the film’s sloppiest camera work to the tune of a emoting pop song is a perfect example why an actor should not be allowed this much vain control in the filmmaking process. Marling stars as an agent for an elite intelligence firm, Sarah Moss, though her approach to going undercover to investigate the enviro-terrorist group is treated as though she were an F.B.I. agent. Clearly this would be a stretch for the young actress, so instead she is working for some unknown firm of rich executives. Since Sarah is on the side of the rich 1% in her investigation, she must also be naively Christian in order to enforce even more of the film’s asinine stereotypes and melting pot of half-baked ideas. This film is filled with nonsensical script additions such as this, which must not have appeared to be a problem for Marling as long as she made herself look good and wrote her character into every scenes of the film. One of the movie’s more obnoxious moments is when Sarah checks into a hotel in order to dye her brown hair peroxide blonde in order to fit in better with the hippie terrorists. Not only does the dye job seem contradictory to her cover, but the bottle job is followed up by shots of her perfectly highlighted hair, complete with brown roots which mysteriously grew in a matter of minutes. This is a thriller which takes itself far too seriously, especially considering there is not a single scene without a glaring plot-hole to tear down the illusion of self-declared sophisticated entertainment. Like the group of wannabe modern hippies calling themselves ‘The East,’ there are so many attempts at forcing random elements together that the result is nothing more than a large unorganized mess. Though the film looks fantastic, the structure offers as much stability as the rundown shack the group hides out in for much of the film. The only thing worse than a stupid movie is one filled with the disillusion intelligent, and The East is the most self-important thriller in years. 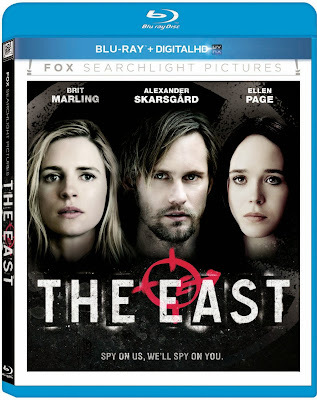 The Blu-ray includes several making-of featurettes about the script and the cast, as well as some agenda-minded features that discuss the left-wing ideas inserted into the film’s screenplay. None of these features are recommended for anyone who felt the way I did about this film, unless you need more proof of the filmmakers’ sense of self-importance.